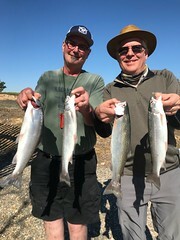 Returning clients Mike and Charlie booked a trip with me on the Sacramento River to chase king salmon, I invited Dan Bacher along as a thank you for writing some previous articles, and if we caught fish I am sure their will be an additional article. We launched the boat and many people were already downstream fishing, but this is okay as there was no pressure at the ramp. After setting our four rods it wasn’t even ten minutes and the starboard side rod started pulsing, so Mike grabbed the rod and after a fairly quick fight we had our first fish of the day in the boat. 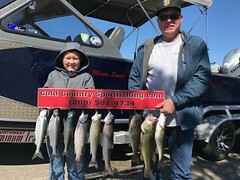 After resetting the rods not even another 100 feet the same rod went down again this time Charlie was at the rod and into a good fight and it was soon in the net. This was all by 7:30. instead of going back up-stream I continued on as there was to many boats on top of each other. It was about and hour and a half and the same rod again went down this time Dan grabbed the rod and this fish was way bigger and put up a great fight and it took a several minutes to subdue the big fish, however the fisherman won the battle and it was in the net!!. So now lets see if it would be possible If I could catch a fish, as we were heading back up stream all of a sudden the back rod started pulsing violently and after a good battle it was in the net. Four Sacramento River king salmon were in the boat for four fisherman. Thanks again for coming out guys!!!!!! 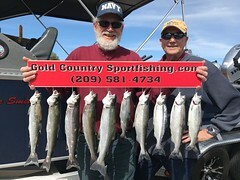 This entry was posted in Gold Country Sport Fishing, King Salmon, Sacramento River King Salmon. Bookmark the permalink.